Arkansas State Senator Johnny Key, Capitol News: The state revenue report for April provided signals of an improving economy in Arkansas, specifically in the number of people working. State government collected $718.2 million in general revenue in April. That is generated almost entirely by state sales taxes and state income taxes. The amount is the most ever collected in one month by Arkansas state government, and it is 5 percent more than was collected in April of last year. State tax rates have not changed, therefore the increase is not due to any tax increase. The good news is that the 5 percent increase in revenue represents growth in economic activity. The state's top budget official presented the revenue report to the legislature's Joint Committee on Economic and Tax Policy. The governor noted the growth in individual income tax revenue and called it "good news" because it means that people are working more. On the same day the state Finance and Administration Department presented the revenue report, the U.S. Bureau of Labor Statistics released an unemployment report for April that indicates the jobless rate had improved in all seven of the metropolitan areas in Arkansas. There are two months remaining in the state's fiscal year. Budget officials said that in spite of the improvement in revenue, they would not change their official forecast. That means no changes are in store, at this time, in the amount of state aid budgeted for state agencies, school districts and institutions of higher education. By nature, Arkansas budget officials are cautious. A specific reason for their caution after reviewing the April revenue report is that sales tax figures are not up to the levels that had been expected. That is an indicator that though people are working more, they are not spending on retail items as much as forecast. The state's budget director said that paying more for gasoline has had a negative effect on retail sales. Motor fuels taxes are not part of general revenue - they are dedicated to maintaining and building highways and bridges. Although the April revenue report was favorable, administration budget officials tempered their remarks by saying that the Arkansas economy was not completely recovered. Also, the threat of a looming financial crisis in the state Medicaid program put a damper on the favorable revenue report. The state Human Services Department, which administers Medicaid, has warned legislators that the program faces a possible budget shortfall ranging from an estimated $250 million to $400 million next year. Medicaid is a government-subsidized program that pays for medical care for low-income families, care and treatment of people with disabilities and nursing home care for the elderly. Addressing the financial problems of Medicaid is shaping up to be the dominant issue of the 2013 regular session. 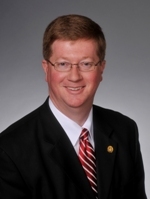 Tags: Arkansas, State Revenue, climbs, Johnny Key, Arkansas State Senator, To share or post to your site, click on "Post Link". Please mention / link to the ARRA News Service. Thanks! Revenue is climbing, yet Mr. Beebe, et. al. want to raise our taxes AGAIN in November--by half a cent state wide!!!???? It's always for a good reason, of course, like roads. How about this novel idea? Let's deal with the spending problem before we give them one more cent! How about they figure out how to keep our roads maintained with the "record revenues" they get now. NO MORE TAXES! I know it was extremely painful to write a check to the state of Arkansas this year. I could not afford to pay my taxes, and I certainly can't afford for them to waste it on liberal programs while my own family can barely pay its bills. And they want to raise my taxes again??? We need to start the anti-tax campaign on May 23 and not let them forget that they have plenty of revenue.